Lamoille Valley Dance Academy Presents “Cinderella” for Spring 2019 Production! Lamoille Valley Dance Academy is proud to present its spring 2019 production of “Cinderella” on Saturday, April 13th at 1:00pm and 6:00pm at Dibden Center for the Arts, Northern Vermont University, Johnson. 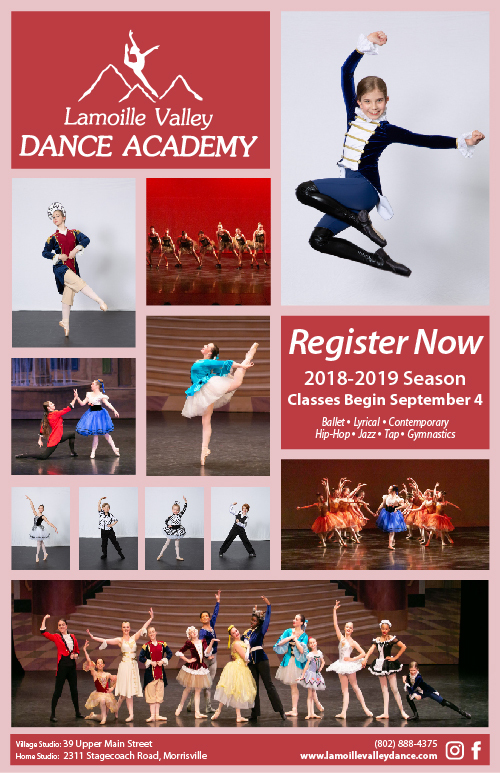 Featuring local students ages 2 through teens, this classic story highlights dancers performing ballet, hip hop, contemporary dance and tap in this beloved Disney story. This is must see entertainment for all families and a wonderful way to expose youth to the arts. Always a popular and sell-out event, LVDA’s spring production is sure to appeal to all ages. Children performing represent Morrisville, Hyde Park, Stowe, Waterville, Jeffersonville, Cambridge, Lowell, Craftsbury, Eden, Hardwick, Montgomery and Newport. Original choreography and concept is by Alexis George-Owen, owner and Artistic Director of Lamoille Valley Dance Academy. Tickets: Adults $18.00 / Children (12 & under) $16.00. At the Door: Adults $22.00 / Childern (12 & under) $20.00. Lap children 2 & under are free. All children requiring a seat must have a ticket. Information on our dance programs can be found on the website at www.lamoillevalleydance.com. And for information about Enchanted Woods Wellness Center’s popular summer kids’ camps, visit the website at www.enchantedwoodswellness.com. You may also contact the studio at 802-888-4375.